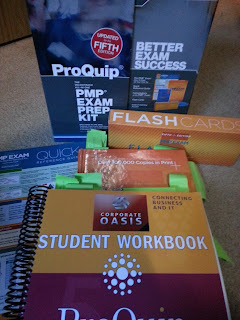 As mentioned in the previous post, last summer I attended the PMP prep bootcamp in Vancouver put on by Corporate Oasis. So in today's blog article I'll give you some feedback on my experience to help you make your own decisions. First off, I quickly learned that the PMBOK materials are extensive. Perhaps that's not the right word... massive? Either way, there is a LOT of material to cover, even for someone like me who has been managing IT projects for many years. The main reason that your years of experience may not be as helpful as you'd think is because the exam itself is based specifically on the content of the PMBOK (R) Guide, and not necessarily the "common sense" approach you've learned through experience. Now that all said, in previous discussions with Paul Robinson of Corporate Oasis, I learned that the materials used for the bootcamp and subsequent self-study are varied and pulled together into a comprehensive learning program. The first mark in favour of this particular bootcamp was Paul letting me peruse the materials before signing up for the class so I could get a sense of the quality. Corporate Oasis leveraged the Velociteach program, which uses a textbook, audio CDs, flash cards, a quick reference guide (read: cheat sheet format), and a customized student workbook. All these materials are extremely helpful as we all have different learning styles and you can work with what works best for you. That would be the second point in favour of the bootcamp. Thirdly, the bootcamp ran for three very full business days. This accelerated program reduces the workplace impact, but all the material still gets covered, including some in-class quizzes to test your learning pace. That all said, you can't be distracted by work or other things during these three days so you'll need to plan your time accordingly. Paul led the classes and has an excellent instruction style. He was highly interactive with the class, measured the pace of delivery based on the progress of the class, and had intentionally kept the class on the small-side of sizing to enable us to get to know each other and learn with and from each other. So I think that's points four and five in favour of this bootcamp. Due to the compressed schedule, there isn't time to teach you how to use the learning materials themselves - but the assumption is that the class is being taken by adults who've learned how to learn, and understand their own optimal learning styles. So be aware of that going in, but it's not so much a mark against the bootcamp, as it is a warning if you are expecting to have your hand held through the process. There is homework during the bootcamp period, but again, to accommodate the compressed schedule that's necessary. So in summary, I would strongly recommend if you are pursuing your PMP certification to take a recognized bootcamp to ensure you get a necessary immersion in the PMBOK materials. And if you are looking at your PMP Bootcamp options, I would suggest you take a good look at the Corporate Oasis offering.